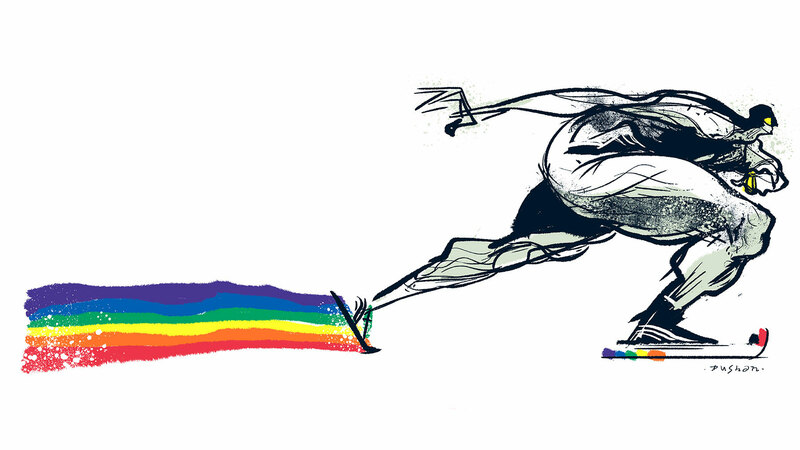 During the Sochi Olympic Games, Grantland will be posting updates from an anonymous blogger, a member of the LGBT community who is traveling to the Olympics this February. This project is created with the help of You Can Play, an organization that promotes diversity and LGBT inclusion in sports. The rain falls hard as I look through the foggy windows of a well-known downtown café in my hometown. Here, I’m surrounded by people who identify as LGBT — or who are at least comfortable living in an open and accepting community, one that welcomes all kinds of differences. The gay village, that is where I am right now. Admittedly, I have not been on these streets in a while, but with only days remaining until the opening ceremony of the 2014 Olympic Games, I thought I should take in as much of this as possible. I still have yet to figure out what part of “this” I will miss or fear losing the most. In fact, I am not even sure what “this” is, but I do know one thing: It is important to me. A public space where individuals can freely and safely express themselves is a sign of progress and maturity. Perhaps that’s it. I’ve gotten so used to this reality, I’ve felt so safe in my own existence, I’m now frightened beyond belief to travel thousands of miles only to go back in time. I’m a member of the LGBT community who will be attending the Sochi Games in February. A nation’s Olympic traveling party is composed of many pieces — coaches, athletes, official representatives, staffers — and I’m a part of that. I can’t tell you how I fit in, but I can tell you what this experience feels like to me. Because I know the fear and anxiety associated with playing sports as a member of the LGBT community. Whether you identify as male or female, sports take place in an overwhelmingly heteronormative environment. Both male and female athletes, at every level of competition, face different narratives about their sexual orientation, but both narratives create intense pressure to stay closeted. It’s an immense struggle I grew up with, no matter which city or country I was in. While I was closeted, this struggle remained my own. I internalized my concerns and I kept all my emotions inside. It was mostly a lonely place and, at times, even scary. Those years were some of the most difficult and secluded of my life. I let no one in and I let nothing out. Looking back now, I am ashamed of the people I lied to and the lengths I had to go through to protect the facade I’d built for myself. So you can imagine the relief when, after decades, I finally decided to tell my teammates, my friends, and, ultimately, my family the secret I had carried my entire life, all on my own. Life after coming out has not always been easy — whether it is on the field, at work, or in conversations with strangers. It remains a daily fight to change hearts and minds, to remind people I am no different because of whom I love. Despite all this, I continue to have faith in the idea that the best gift I can offer to myself and others is to live every day as an honest, open, and loving person. A few years ago, I grabbed some drinks at Stonewall — the New York City bar that is understood and known to be the epicenter of the gay rights movement in the U.S. The Stonewall riots compelled many people (both gay and straight) to fight and stand up to the intolerance occurring in their communities and cities. They fought for a better future; an understanding of equality; safer public spaces — and they fought so that I could one day become so comfortable with my reality that I would almost forget why they even had to fight in the first place. Members of my generation — at least those of us living in more progressive countries in the West — have had little reason to raise their voices to the same level. In fact, very few of us have struggled in the same way others did for the simple right to just be. And now, here I am, about to travel to a place with a very public and troubling record of acceptance, a place that — by all appearances — is pretending to be more modern than it is; ironically, I know a thing or two about pretending to be something I am not. The Olympics have always been about inviting the world into a foreign land. As Russia opens its doors to the world, only my community has been made expressly unwelcome. The moment I step onto Russian soil, I will be forced back into the closet, forced to go back to a place I battled so hard to overcome and forget. In some ways, I’m beginning to finally understand, even if just slightly, what it must have been like to be gay without the fundamental human rights that I have clearly taken for granted. The choice before me is a familiar one: Remain silent or speak for those who cannot. This is my contribution, to write about my experience while in Sochi to help raise awareness. I might be anonymous in Sochi, but I won’t be alone. For more information on YCP, follow it on Twitter or check it out on YouTube.